The first collection received outstanding feedback. Before we describe this collection in detail, allow us to first say that this collection (and this collectors prior) are likely the cleanest collections that we have handled. This Specialized Collection is housed in 13 Green 3-Ring Scott Binders. As with the prior collection, each page was meticulously designed and produced by the collector on very heavy stock paper. 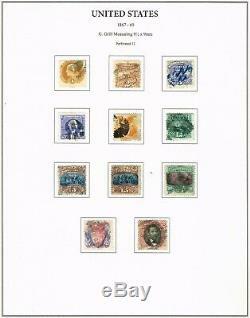 This was done so that each stamp had a perfectly sized place based on its size, format, block, etc. 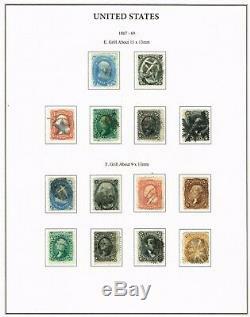 Under each stamp is printed its Scott Catalog Number, any Color or Type variation, etc. Here are the details that you would want to know. Of the entire collection is exceptional. There is no fine print, no special notes, etc. 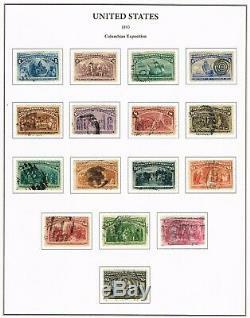 This is a great collection with a lot of value. 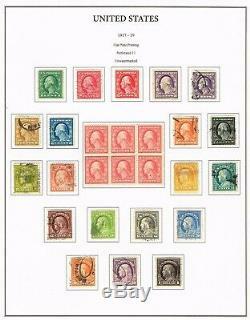 While this was intended to be a United States Specialized Collection of Postally Used Stamps , the reality is that many of the larger format sheets, souvenir sheets and panes are not available in genuine postally used condition, so the collector used Mint sheets/panes/etc. For these items (example is a Mint #630 hinged only in the selvage). The Album Pages are in excellent condition with no pencil notations or markings. All the Scott 3-Ring Albums close perfectly, and the rings align precisely. Following a career as an Army Officer and Engineer, the Collector was commercial airline pilot. His attention to almost obsessive detail is breathtaking. CONTENTS OF THE 13 ALBUMS ARE AS FOLLOWS. 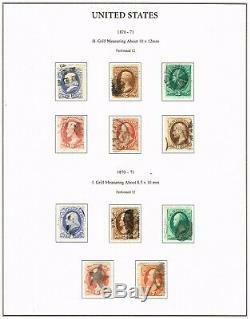 Here are some observations that should underscore the value in this collection. Although we included high-resolution scans of key pages, the following should provide even greater detail. Scott #8 Plated to Pos. Scarce #25A Plated to Pos. No Spaces for a #27, #28, #30, #31, #34. E-Grills are Complete with a 2001 APS Cert for the #91. There are no Spaces for Re-Issues. Scott #315 Used Wide Margins. The Only Bluish Paper is a #369. Washington-Franklin Coils are Present (Except #356). PF Certs for #387 and #488. There is no Space for a #534B. 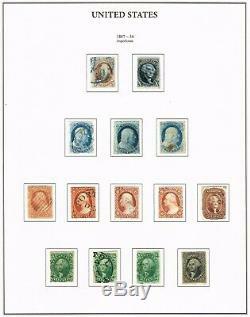 Full White Plains Sheet (#630) is Mint, Original Gum, Hinged in Selvage Only. Collection is Complete through Scott #5323 (2018) Including a Recalled Legends Sheet. 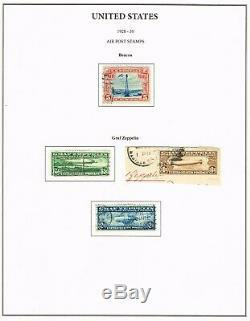 Air Post if Complete (#C1-C150) Including a Nice Set of Zepps. Office in China Complete to #K11 Plus #K16. Early Officials are Lightly Populated. Revenues are Quite Nice, Missing the Larger Formats. Ducks are Complete though 1997, then Missing a Few After That. Includes a Mint, #RW1 Without Gum. 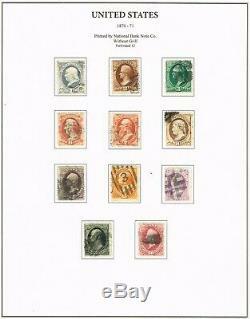 The Collector had a Passion for Early Postal Stationary & Cut Square. The Possessions are Nicely Populated, Not Complete. We are not Expert Enough on Possessions to Provide any Quality Observations. 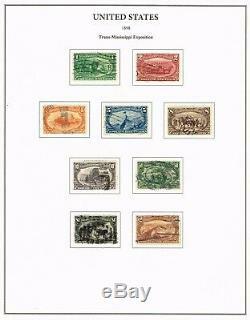 The obvious caveat is that these are our observations along with those of our Philatelic Team. As with any collection, regardless of the collector, faults, etc. Should be expected and you should factor this into your valuation. Also, we are happy to scan and send you any other page that you might desire. As you may have seen from our listings, we sell larger philatelic and numismatic holdings in conjunction with various Estate Trustees. Actual photos are shown with this listing. We enjoy an excellent reputation and we pride ourselves in a very large percentage of repeat buyers for our Estate Collections. The accuracy of our listings is of paramount importance to us and to you. If you see any errors in our listing, please send us a message and we will quickly correct any error. These 13 Albums, Pages weight 58 pounds without any cartons and packing. Of course, local pick-up at our offices in West Palm Beach is free. Please do not hesitate to ask any questions whatsoever. 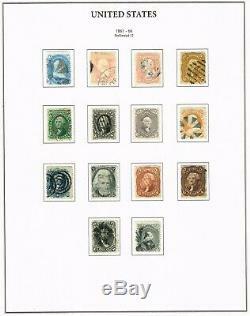 The item "INCREDIBLY COMPLETE 13 VOLUME UNITED STATES SPECIALIZED STAMP COLLECTION CERTS" is in sale since Sunday, February 17, 2019. 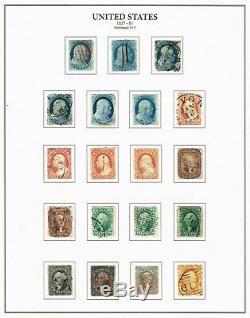 This item is in the category "Stamps\United States\Collections, Lots". The seller is "harvard-mba" and is located in West Palm Beach, Florida. This item can be shipped to United States.